La Via Crucis ou le chemin de croix dévotionnel est essentiellement un spectacle théâtral et rituel d'un des principes théologiques du christianisme : la Passion du Christ. Sur le continent hispano-américain, au début de la période moderne et parallèlement à la conversion des peuples autochtones, la tradition de la Via Crucis a été adoptée avec la foi chrétienne. L'un des exemples les plus remarquables de ces ensembles architecturaux en Amérique espagnole se trouve dans la ville de Puebla, au Mexique. Il s’agit d’un témoignage de l'effort explicite de cette ville pour refléter la ville de Jérusalem — l'axis mundi lui-même. If the Holy City of Jerusalem presented itself to St. John descending from the skies […] being that glorious city such in likeness to this one of Puebla, and having been the same [angels] who traced its streets none others than those who, by order of the Mighty One, traced those of the Sacred Zion we can with careful discourse infer the resulting beauty of this Angelic City. However, the only city created under this experimental model was Puebla de los Ángeles, and this might be because the creation of this city was received with great animosity by the powerful encomenderos in Mexico City, who felt the founding of Puebla could defy their economic and political ambitions. It was also ill-received by the indigenous towns close to Puebla, who resented that eventually—and in betrayal of the city’s initial social idealism—the Puebla settlers would ask to make use of the encomienda system after all, demanding to employ the indigenous peoples’ labor from towns such as Tlaxcala, Cholula, Tepeaca, among others. The Spanish settlers in Puebla weighed their demands against the threat of abandoning the incipient settlement, which would have been observed as a defeat for the civil authorities, represented by the Audiencia tribunal, who finally allowed the encomienda to be employed by the settlers, therefore betraying the city’s initial idealistic aspirations.7 Apart from the change in the city’s initial social agenda, the city also struggled to attract settlers and suffered a severe setback when the initial foundation had to be moved due to seasonal floodings. My objective in this discussion is not to present a historiography of the Via Crucis of Puebla. Rather, I wish to discuss its significance as a symbolic and ritualistic element which, through its urban and topographical characteristics, was able to provide the city’s inhabitants with a direct link to an understanding of the city as a living body, an identification that occurs through the remembrance of the body of Christ himself. In other words, my hypothesis is that Puebla de los Ángeles’ Via Crucis has been able to provide the faithful—for some four-hundred years—through their engagement in the ritual of the Passion, with an embodied dimension that places them as active participants in the city’s symbolic relationship with a higher order of their ritualistic, Catholic universe. Through the Via Crucis as physical setting, the remembrance of Christ’s Passion becomes a religious ritual that asks for the participants’ bodily and emotional involvement in its recreation. For centuries now, Puebla de los Ángeles has been, at every calendric cycle of the Catholic Church, identified as being at an equal footing with the terrestrial Jerusalem, the proverbial center of the Christian world and with the Heavenly Jerusalem as well, the City of God itself, symbol of the end of times in the Christi an Parousia. The mythology persisted and was advanced by other later Franciscans, such as Friar Juan de Torquemada (c.1562–1624), who wrote in his famed Monarquía Indiana, first printed in 1615, that God’s mercy had it that the Franciscan missionaries would build a city dedicated to His angels, in order to cleanse a territory where false idols were once adored.14 Both Benavente’s and Torquemada’s words highlight the desire to fabricate the notion of the creation of Puebla as a veritable civitas Dei—an urban epiphany of sorts in the middle of a territory surrounded by important indigenous city-states, such as Cholula and Tlaxcala. Another element that confirmed the relationship to Jerusalem as urban paradigm is registered visually in the design of the city’s seal of arms. The seal displays a city-temple with five towers, visually related to a tradition of medieval and early modern imagery of the City of God. A representation of the Heavenly Jerusalem in the Liber Floridus, by Lambert von Saint-Omer in the twelfth century, for instance, displays a strong resemblance to Puebla’s seal of arms. 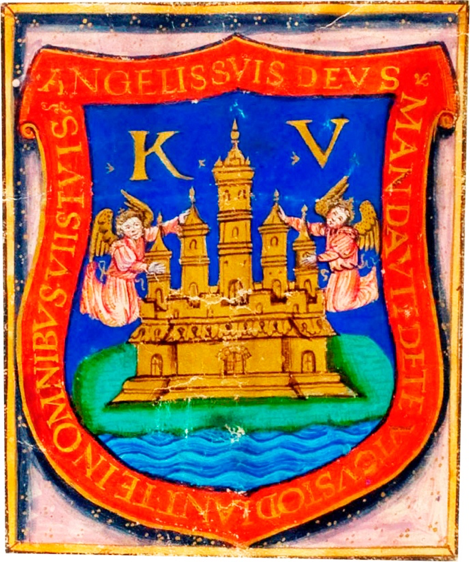 In Puebla’s seal of arms, the city-temple is flanked by two angels, as if guarding it, with the city presenting three entrances.22 Further, a banner framing the seal displays Psalm 91:11: Angeluis suis Deus mandavit de te ut custodiant te in omnibus viis tuis, “for he shall give his angels charge over thee, to keep thee in all thy ways” (see Fig. 1). Fig. 1. The shield of arms of the city of Puebla, as presented in the Cédula Real or royal charter, endorsed and signed by Queen Juana de Castilla in Valladolid, Spain, in 1538, and by her secretary, Juan de Sámano. In general terms, the devotional practice of the Via Crucis carries a series of phenomenological attributes symptomatic of the ritualistic life and cycles of a city in the early modern period, in which civic life was tied to calendric and ritualistic activities that marked the passing of time. The word phenomenology here is employed in an adjectival form, i.e., a phenomenological approach to a ritualistic phenomenon, one in which the subject becomes involved in a bodily and emotional manner and in which that dual body-mind involvement defines their conscious experience. To this effect, in Puebla’s Via Crucis, the participants of the ritual are not only involved in a spiritual manner, one in which their consciousness becomes intertwined with contemplative practices of praying accompanied by intimate meditations. But further, the participants’ experience is embodied, which dictates that there is an interaction between the subject’s mind and its built environment. To that effect, the topography in a Via Crucis, whether in Puebla de los Ángeles, Jerusalem, or the Sacri Monti in Lombardy, engages an intimate relationship between religious expression and the landscape, and it is through the ritualistic remembrance and physical navigation of the site that the worshipper feels and experiences the city or the site as a ‘living body,’ in other words, carnally. It is not excessive to state that believers engage in the embodied experience of—truly feeling—Christ’s ordeal: his pain, his sacrifice, and his redemption, by way of performing the devotional ritual; it is paramount to note how the faithful experience His pain, His piety, and then make it their own. The collective participation in the planning and building of the Via Crucis complex is a relevant fact, because it suggests the idea that architectural enterprises, whether a church building or in this case, a processional route articulated by small chapels, points toward the idea that in the early modern period, as architectural historian Alberto Pérez-Gómez affirmed, architecture “was especially dedicated to the representation of significant human action”.32 During the early modern period, rituals and the built spaces in which they took place, “allowed for the recognition of an individual’s place in society and in relation to the natural world”.33 In a similar vein, architectural historian Françoise Choay affirmed that the relationship between humankind and organized space in the European context of the early modern period was dictated to a large extent by a religious understanding of the lived world. Specifically, she wrote that up to the fifteenth century, “religion and the sacred have traditionally been the major factors organizing human space, either through the action of the spoken word or through the written word”.34 This idea corresponds with the collective nature of the construction of the Via Crucis at Puebla, which points toward the notion that the intentionality of collective architectural-urban efforts during the early modern period were based on transcendental and largely symbolic elements, those that would aim at reconciling earthly existence with the heavenly realm. Furthermore, both Via Cruces act on a similar manner from a processional point of view: in Puebla’s case, the procession begins at the Franciscan monastery, traverses a short topographical descent, in order to then begin ascending up the Cerro de Belén, or Bethlehem Hill. The ritualistic procession at Jerusalem follows a similar order: the procession starts close to the Temple Mount (the Temple and the monastery being analogues as we have seen), and then descends in order to begin ascending up again towards Calvary Hill. In Puebla’s mirroring of this topography, the Cerro de Belén, wherein lies the Iglesia del Calvario or Calvary Church, evokes Jerusalem’s own Church of the Holy Sepulcher, standing in for Jerusalem’s own Calvary Hill. At the Iglesia del Calvario in Puebla, the representation of the last six stations of the Via Crucis are celebrated, in a mimicking of the Church of the Holy Sepulcher in Jerusalem, which hosts the last five stations of the procession. The Via Crucis in Puebla during the colonial period followed this order: the processional ritual, which took place in the early afternoon of Holy Friday, started out inside the Franciscan church, a part of the monastic complex, where the first station, “Jesus is Presented to Pilate,” took place. The procession then moved out onto the streets, stopping at the second station, “Jesus Carrying the Cross on His Back,” at a chapel attached to the Franciscan church building’s side. The third station, “The First Fall,” was part of the Franciscan monastery’s peripheral wall, now destroyed (this is the only chapel that has been completely lost). The fourth station initiates the climb up the Cerro de Belén, it is a chapel popularly known as “Los Fieles Amantes,” and it sits in the vicinity of the Franciscan monastery, on present-day 14 Oriente Street. The fifth station, “El Cirineo,” a reference to Simon of Cyrine, is also located on 14 Oriente Street, merely some 50m up the street. The sixth station is represented by a chapel popularly still known as “La Verónica,” a reference to St. Veronica’s wiping of Jesus’ face in the Via Crucis narrative, and is located on present-day 12 Norte Street, across a narrow backstreet from the Santa Cruz church building. The seventh station is represented by the chapel called “La segunda caída,” a reference to Jesus’ second fall, also on present-day 12 Norte Street. The eighth station is represented by the chapel still known as “Las Plañideras” or “Las Piadosas,” in reference to a group of women Jesus briefly addresses on the Via Dolorosa, on his way to Mount Golgotha. This station’s patron was Alejandro Fabián, a man now remembered for having been in epistolary correspondence with Athanasius Kircher. The remaining stations are all concentrated in the church building of El Calvario; where stations ninth through fourteenth are all housed within the same complex. These stations are: ninth, the “Third Fall”; tenth, “Jesus is Stripped of His Clothes”; eleventh, “Jesus is Nailed to the Cross” (popularly known as “Capilla de los Pobres,” as it was completely sponsored by the poor inhabitants of the neighborhood); twelfth, “Jesus Dies on the Cross”; thirteenth, “Jesus is Taken Down from the Cross,” and fourteenth and last, “The Holy Sepulcher”.38 (see Fig. 2 through 5). Fig. 2. A map of Jerusalem pointing to the Hinnom and Kidron streams, as well as the Via Crucis route. Credit: Google Earth image edited by author. Fig. 3. A map of Puebla’s El Alto district, pointing to the topographical similarities between Puebla and Jerusalem. Of notice are the two bodies of water, the San Francisco River and the Xonaca Stream, which demarcated the Via Crucis area. Credit: Google Earth image edited by author. Fig. 4. A diagram pointing at each Via Crucis station along the processional route in Puebla de los Ángeles’ El Alto district. Credit: Google Earth image edited by author. Fig. 5. A 1650 map of Puebla, which illustrates the Via Crucis relative to other landmarks in Puebla’s historic district. Credit: Public domain image digitally edited by author. From a symbolical-religious perspective, mountains and hills carry various symbolic meanings; for one, as outstanding topographical features they can be considered to represent the place where heaven and Earth meet. In other instances, a mountain or hill can be also understood as an omphalos, a symbolic navel. Giovanni Filoramo points out how this condition is expressed in the literature of the Christian mystics: “Richard of Saint Victor described the degrees of contemplation as the ascension of a mountain; Saint John of the Cross titled one of his most important works, “Subida del monte Carmelo”; and Mechthild of Magdeburg defined God as ‘a mountain’”.42 It is not surprising then that Puebla’s Via Crucis places its processional element at the center of its operation, in other words, the act of ascension becomes a relevant concept in the re-enactment of the Passion of Christ. The topographical experience signals the importance of the events being remembered, a schism between Heaven and Earth, i.e. Christ’s mortal death, which in turn also signals the promise of his return, the hope of heaven and earth being conjoined again. Thus, the Via Crucis is a symbolic navel of the city. As an architectural complex, a string of chapel-stations strewn along the city’s mountain, the Via Crucis marks a most important revelatory point of conjunction with the heavenly, the place where Christ died and, according to Christian doctrine, will return to redeem humanity from its mortal condition. The Sacrimonti and Via Crucis are part of a series of innovative types of spiritual practices that were created around the fifteenth century in Flanders. As art historian Antonio Bonet Correa wrote, they are the product of the Devotio moderna, a sensual and more sentimental way of expressing a person’s faith in the context of an early modern approach to devotional practices that valued personal experience and reflection.43 Puebla’s Via Crucis, as was argued in this paper, is relevant for various reasons, not least because of its topographical mimicry of Jerusalem. It is also surprisingly well-preserved in the context of a city that has suffered much destruction of its historical built heritage and a tremendous increase in urban density. Finally, if we are to attend to Bonet Correa’s definitions and distinctions between a Sacrimonti and a Via Crucis, Puebla’s urban-architectural complex is a hybrid between the two. Indeed, Bonet Correa supports the idea that a Sacrimonti is characterized by being usually laid outside an urban area in a topographical ascent, and for having a series of decorated chapels, which, in their most sophisticated iterations, are veritable theatres of the sacred with real-life scaled sculptures and painted scenographies. Via Cruces, on the other hand, according to Bonet Correa, are made up of the various stations in the narrative of the Passion and could be located inside a church building or outside, in an urban area for instance, along a designated route and marked by a series of small crosses or markers. Puebla’s Via Crucis, when it was originally built in the sixteenth and up until the eighteenth century, was located in the outskirts of the city, in Bethlehem Hill, a somewhat rugged area devoid of lush vegetation, and is constituted not by simple crosses or markers, but by small chapels, making it a hybrid between a Sacrimonti and a Via Crucis. Regardless of whether Puebla’s Via Crucis sits somewhere in between one definition or another, the fact remains that it is an extremely understudied artifact, as there is no notion whatsoever of the chapels’ interior decoration nor the architectural aspects of the chapels themselves. This essay highlighted how the Via Crucis complex at Puebla served to advance the city’s self-notion of exceptionalism during the city’s colonial period—i.e., its identification with Jerusalem as the axis mundi. Further, it has also tried to expose the possibilities of an architectural complex such as this one when it comes to revealing and helping to delineate a city’s image of itself and for its inhabitants. In essence, Puebla’s Via Crucis—a remnant of a cultural urban and spiritual tradition from the early modern period—has survived to our days while it continues to bridge the gap between the earthly and the heavenly for the faithful who continue to celebrate its processional ritual each year. Fig. 6. The first chapel of the Via Crucis complex, corresponding to the second station, “Jesus Accepts His Cross” (the first station was enacted inside the Franciscan church). This chapel station is attached to the Franciscan church building’s side. The church’s bell tower is visible to the right. Credit: Google Street View screenshot. Fig. 7. The second chapel of the Via Crucis complex, corresponding to the fourth station (the second chapel, corresponding to the third station, was destroyed). It is popularly known as “Los fieles amantes,” and it is located on present-day 14 Oriente Street. Credit: Google Street View. Fig. 8. The third chapel of the Via Crucis ritual complex, corresponding to the fifth station, popularly known as “El Cirineo” (a reference to Simon of Cyrene), located on present-day 14 Oriente Street. Credit: Google Street View. Fig. 9. The fourth chapel of the Via Crucis ritual complex, corresponding to the sixth station, popularly known as “La Verónica” (a reference to St. Veronica who wiped Jesus’ face in the Via Crucis narrative), located on present-day 12 Norte Street. Credit: Google Street View. Fig. 10. The fifth chapel of the Via Crucis ritual complex, which corresponds to the seventh station and is located on present-day 12 Norte Street. Credit: Google Street View. Fig. 11. The sixth chapel of the Via Crucis ritual complex, which corresponds to the eighth station, popularly known as “Las Piadosas” chapel. Credit: Photo by author. Fig. 12. 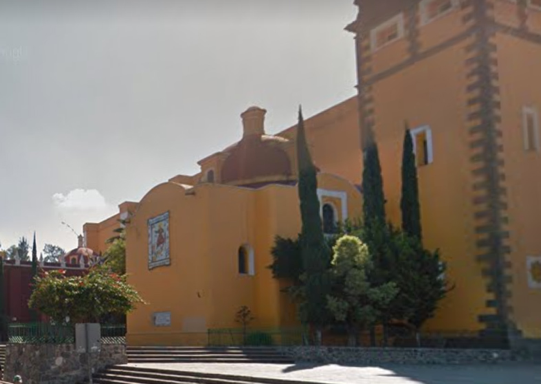 This image shows the Iglesia del Calvario architectural complex, the last stop and most architecturally sophisticated element in the Puebla Via Crucis, wherein the seventh, eighth, ninth, tenth and eleventh chapels of the Via Crucis, together with the Santo Sepulcro, are located, corresponding to the ninth, tenth, eleventh, twelfth, thirteenth, and fourteenth stations. Credit: Wikimedia Commons. Diego Antonio Bermúdez de Castro, Theatro Angelopolitano ó Historia de la Ciudad de la Puebla, escrita por D. Diego Antonio Bermúdez de Castro, Escribano Real y Notario Mayor de la Curia Eclesiástica del Obispado de Puebla (México City, 1746), p.148. Translation by author. This essay is largely based on Chapter 5 of my doctoral dissertation. I would like to thank the scientifical committee of the conference “Inside the Ritual” for additional comments and suggestions. See: Burke, Juan Luis, “Angelorum Civitas: The Symbolic Urbanism of Puebla de los Ángeles in the Early Modern Era”, doctoralPhD dissertation., McGill University, Montreal, 2016. Julia Hirschberg, ““La fundación de Puebla de los Ángeles: Mito y realidad,” Historia Mexicana - El Colegio de Méxicovol. 28, no. 2, (1978, p.): 185-223. For a comprehensive history and analysis on the phenomenon of the encomienda de indios, see: Silvio Arturo Zavala, La encomienda indiana, (Madrid, : Helénica, 1935). For a detailed account of Puebla’s foundation and details on the settlers’ demands to employ the encomienda system, see:Guadalupe Albi Romero, “La sociedad de Puebla de los Ángeles en el siglo XVI,,” in Ángeles y Constructores: Mitos y realidades en la historia de Puebla, siglos XVI y XVII, (Puebla, : BUAP, Gobierno del estado de Puebla, 2006), p. 127-206; Hirschberg, “La fundación de Puebla de los Ángeles,” François Chevalier, Significación social de la fundación de la Puebla de los Ángeles, Puebla, Mexico: Centro de estudios históricos de Puebla, 1957. Guadalupe Albi Romero, “La sociedad de Puebla de los Ángeles en el siglo XVI,”in Ángeles y Constructores: Mitos y realidades en la historia de Puebla, siglos XVI y XVII, Puebla: BUAP, Gobierno del estado de Puebla, 2006, p. 127–206; François Chevalier, Significación social de la fundación de la Puebla de los Ángeles, Puebla, Mexico, Centro de estudios históricos de Puebla, 1957; Julia Hirschberg, “La fundación de Puebla de los Ángeles: Mito y realidad,” Historia Mexicana - El Colegio de México, vol. 28, no. 2, 1978, p. 185-223. Kevin Lynch, Chapter 1:“The Image of the Environment,” The Image of the City, 1st edition, Cambridge, Mass., The MIT Press, 1960. Antonio Rubial García, “Los ángeles de Puebla. La larga construcción de una identidad patria,” in Poder civil y catolicismo en México, siglos XVI al XIX, Mexico City, : Instituto de Investigaciones Históricas UNAM – Instituto de Ciencias Sociales y Humanidades BUAP, 2008), p. 103-28. The existence of urban Via Cruces in the most relevant cities of the New Spanish viceroyalty was common, but unlike other Via Cruces found in cities that concentrated large Spanish populations in New Spain, such as Mexico City or Santiago de Querétaro, Puebla de los Ángeles’ Via Crucis with its topographic mimicry stands as a unique example of its kind.See: José Miguel Muñoz Jiménez, “Sobre la ‘Jerusalén restaurada’: Los calvarios barrocos en España,” Archivo Español de Arte (AEA), vol. LXIX, no. 274, June 1996, p. 157-69. See Fig. 4 for a graphic breakdown of the existing chapel-stations in Puebla’s Via Crucis and subsequent figures illustrating the chapel-stations. Alena Robin, Las capillas del Vía Crucis de la Ciudad de México: Arte, patrocinio y sacralización del espacio, First Edition, Mexico City, UNAM - Instituto de Investigaciones Estéticas, 2014, p. 209. Fray Toribio de Benavente, Memoriales: Edición crítica, introducción, notas y apéndice, Mexico City, El Colegio de México, 1996, p. 363. Translation by author. Fray Juan de Torquemada, De los Veintiún Libros rituales y Monarquía indiana, Mexico City, Instituto de Investigaciones Históricas – UNAM, 1979, vol. I, p. 426-427. Two studies that trace the mythology of the city of Puebla from the sixteenth to the eighteenth centuries are those by Martha Fernández and Antonio Rubial. See: Martha Fernández, “La Jerusalén celeste. Imagen barroca de la ciudad novohispana,” in Actas III Congreso Internacional del Barroco Americano: Territorio, Arte, Espacio y Sociedad, Sevilla, Universidad Pablo de Olavide, 2001, p. 1012-1031; Antonio Rubial García, “Los ángeles de Puebla. La larga construcción de una identidad patria,” in Poder civil y catolicismo en México, siglos XVI al XIX, Mexico City: Instituto de Investigaciones Históricas UNAM – Instituto de Ciencias Sociales y Humanidades BUAP, 2008, p. 103-128. Rubial García, 2008, p. 107. Gil González Dávila, Teatro eclesiástico de la primitiva iglesia de las Indias Occidentales, vidas de sus arzobispos, obispos, y cosas memorables de sus sedes, Madrid: Diego Díaz de la Carrera, 1649, p. 83. Antonio Rubial García, El paraíso de los elegidos: Una lectura de la historia cultural de Nueva España (1521-1804), Mexico City, FCE - UNAM, 2010, p. 230. Carlos Montero Pantoja, Arquitectura y urbanismo: De la Independencia a la Revolución, dos momentos claves en la historia urbana de la ciudad de Puebla, Puebla, Mexico, BUAP, Ediciones de Arte y Cultura, 2010. See chapter 1. If the city-temple were imagined as square or rectangular in plan, we could visualize the edifice as having 12 entrances, as in the description of the Heavenly Jerusalem by John, Revelation, 21. Amédée Zedelgem da, “Saggio storico sulla devozione alla Via Crucis,” in Saggio storico sulla devozione alla Via Crucis a cura di Amilcare Barbero e Pasquale Magro. Edizione originale del 1949, traduzione dal francese di Paolo Pellizzari, Turin: Italy, Centro de Documentazione dei Sacri Monti, Calvari e Complessi devozionali europei, 2004, p. 67. Kenneth Nebenzahl, Maps of the Holy Lands: Images of Terra Sancta Through Two Millenia, First Edition, London, Abbeville Promotional, 1990, p. 33. Tradition has it that St Francis of Assisi himself traveled to Palestine in 1219, and although he never actually managed to make it there, he indirectly established a long tradition between his order and terrae sanctae.The Franciscan’s presence in Jerusalem and Palestine date back to the early thirteenth century, when the Franciscan province of Syria was established. Towards the end of this same century, they were allowed to establish themselves in the Cenacle, on Mount Zion. Pope Clement VI declared them the official guardians of the Holy Sites in 1342, and to this day, they are still the official Catholic guardians of the Holy Sites. Franco Cardini, “I Sacri Monti nella tradizione cristiana latina”, in Religioni e Sacri Monti Atti del Convegno Internazionale Torino-Moncalvo-Casale Monferrato, 12–16 ottobre 2004, Turin, Centro de Documentazione dei Sacri Monti, Calvari e Complessi devozionali europei, 2006, p. 109. Miguel Zerón Zapata and Manuel Fernández de Santa Cruz, La Puebla de los Ángeles en el Siglo XVII: Crónica de la Puebla, Mexico City, Editorial Patria, 1945, p. 107. Although this article does not allow for a deeper historiographical analysis, Mariano Fernández de Echeverría y Veytia, Miguel de Alcalá y Mendiola, and Hugo Leicht all list the patrons in the collective effort that was the construction of the Puebla Via Crucis, and identify the year 1606 as the date in which construction of the chapel-stations started, without specifying any subsequent dates thereafter. The chroniclers identify the following patrons: starting with Diego Marín, a local sculptor, who is reported by the chroniclers as having built (or sponsored?) the vault of the second chapel-station, which is attached to the nave of the Franciscan church building (see Fig. 6).Friar Jacinto Rosales, a Franciscan priest, was the patron of the third chapel-station (now destroyed). Gaspar Toreno had the fourth chapel-station built.Andrés Bañuelos had the fifth chapel-station built, now still popularly identified as the Cirineo chapel (for Simon the Cyrene). Antonio Hernández de Priego was the patron for the sixth chapel-station, the Saint Veronica station. Pedro de Medina was the patron that paid for the construction of the seventh chapel-station, whose expenses were later adopted by the Dean of the Cathedral at the time, don Diego de Victoria Salazar. Don Juan de Alexandro Fabián was the patron of the eighth chapel-station who is also credited with convincing other citizens for the importance to push forward and complete the Via Crucis ritualistic cycle with the remaining chapel-stations. The ninth to the fourteenth stations are all located in the same architectural complex, known as the Iglesia del Calvario. Nicolás Coronado was the patron of the ninth chapel-station within the complex, while two brothers, Melchor and Juan del Hoyo were responsible for building the tenth chapel-station by themselves, known popularly as the “Capilla del Despojo,” the station which sees Jesus stripped of his clothes. The next station, the eleventh, also known as the “Capilla de los Pobres,” was collectively built with the work and alms of the neighborhood.The following chapel-station, called “Capilla de la Expiración,” the twelfth, is the most architecturally sophisticated of the whole cycle and the largest chapel-station, a man identified as licenciado Martín Fernández was the patron. The next chapel-station, identified as “Capilla de Nuestra Señora de la Piedad,” was built and maintained by Andrés de Illescas. Finally, the last chapel-station, the fourteenth, was built and paid for by Diego Marín, a sculptor and by the licenciado Juan de Altamirano. See: Alcalá y Mendiola, Descripción en bosquejo de la imperial cesárea muy noble y muy leal Ciudad de Puebla de los Ángeles (paleographic edition of the c.1696 original), p. 155-157; Mariano Fernández de Echeverría y Veytia, Historia de la fundación de la Ciudad de la Puebla de los Ángeles en la Nueva España, su descripción y presente estado, vol. II, Puebla, Mexico, Ediciones Altiplano, 1962, p. 276-282; Hugo Leicht, Las calles de Puebla, Tenth Edition, Secretaría de Cultura, Gobierno del Estado de Puebla, 2009, p. 50-53. Alberto Pérez-Gómez, Built Upon Love, Cambridge, Mass., MIT Press, 2008, p. 125. Keith D. Lilley, City and Cosmos: The Medieval World in Urban Form, London, Reaktion Books, 2009, p. 158. Mariano Fernández de Echeverría y Veytia, Historia de la fundación de la Ciudad de la Puebla de los Ángeles en la Nueva España, su descripción y presente estado, vol. I, Puebla: Mexico, Ediciones Altiplano, 1962, p. 276; Miguel Alcalá y Mendiola de, Descripción en bosquejo de la imperial cesárea muy noble y muy leal Ciudad de Puebla de los Ángeles (paleographic edition of the c.1696 original), Puebla, Mexico, BUAP, 1992, p. 155-56; Augustín Vetancurt de, Teatro Mexicano: Descripción Breve de los Sucessos Exemplares, Históricos, Políticos, Militares y Religiosos del Nuevo Mundo Occidental de las Indias, Tratado de la Ciudad de México, y las Grandezas que la Ilustran después que la Fundaron los Españoles. Tratado de la Ciudad de la Puebla de los Ángeles, y grandezas que la Ilustran (por doña Maria de Benavides viuda de Iuan de Ribera, 1698). Leopoldo García Lastra and Silvia Castellanos Gómez, Utopía Angelopolitana, First Edition, Puebla, State Government of Puebla, 2008. See Chapter 5, dedicated to the Via Crucis of Puebla. Montserrat Báez Hernández and Fabián Valdivia Pérez, Guía de patrimonio religioso de la ciudad de Puebla, Puebla, Mexico, Ayuntamiento de Puebla, 2012, p. 437-451. Mircea Eliade, The Sacred and the Profane: The Nature of Religion, New York, Harcourt, Brace, and World, 1961. See Chapter One: “Sacred Space and Making the World Sacred”. Thomas Matus, “Religioni, ambiente, paesaggio,” in Religioni e Sacri Monti Atti del Convegno Internazionale Torino-Moncalvo-Casale Monferrato, 12–16 ottobre 2004, Turin, Centro de Documentazione dei Sacri Monti, Calvari e Complessi devozionali europei, 2006, p. 66. Ida Zatelli, “Monti e luoghi elevati nella bibbia ebraica: monti di dio e sacralità di Sion,” in Religioni e Sacri Monti Atti del Convegno Internazionale Torino-Moncalvo-Casale Monferrato, 12–16 ottobre 2004, Turin, Centro de Documentazione dei Sacri Monti, Calvari e Complessi devozionali europei, 2006, p. 103. Giovanni Filoramo, “I monti sacri nella storia delle religioni”, in Religioni e Sacri Monti Atti del Convegno Internazionale Torino-Moncalvo-Casale Monferrato, 12–16 ottobre 2004, Turin, Centro de Documentazione dei Sacri Monti, Calvari e Complessi devozionali europei, 2006, p. 55-56. Antonio Bonet Correa, “Sacromontes y calvarios en España, Portugal y América Latina,” in La “Gerusalemme” di San Vivaldo e i Sacri Monti in Europa. Firenze-San Vivaldo, 11–13 settembre, 1986, Florence, Centro internazionale di studi “La ‘Gerusalemme’ di San Vivaldo” – Comune di Montaione, 1986, p. 174. Juan Luis Burke is an architect and an architectural historian. Presently, he teaches design studio, as well as history and theory of architecture at the University of Maryland's School of Architecture, Planning and Preservation. His research interests revolve around the history and theory of the architecture and urbanism produced during the period ranging from the sixteenth century to the present, with an emphasis on Latin America -particularly Mexico- and the connections between this region with Spain, Italy and North America. He holds a Master's of Architecture and a Ph.D. in architectural history and theory from McGill University.